Aside from the UI refresh, there's really nothing new going on so far as we can tell. Google plans to roll out an updated version of the Market (Play) to Android 2.2+ devices in the coming days, as well as to discontinue the Market branding. The move makes sense for Google, as the company has increasingly become a content powerhouse thanks to the rapid adoption of Android around the world. Google's real goal here seems to be to give the impression that no matter where you go, or what device you're on, that the Google Play experience is consistent throughout. Watching movies, listen to music, or read eBooks on your phone, tablet, or desktop computer. 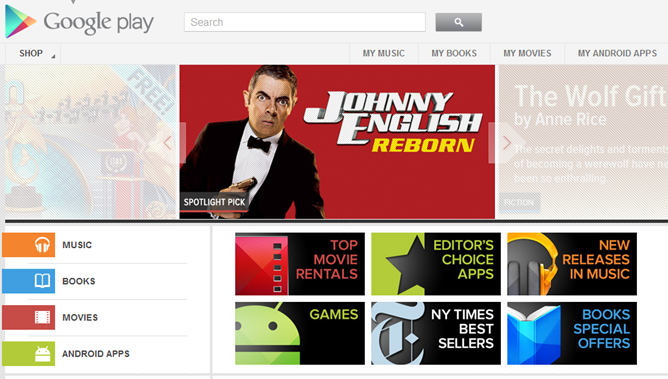 These features aren't new, but Google definitely hasn't done a great job of advertising them to mainstream consumers. I think I smell a marketing campaign. And let's face it, the Market was kind of a boring name. But I'm not sure Play is a whole lot better. The logo's nicer, though. Check out the Google Play web store now.